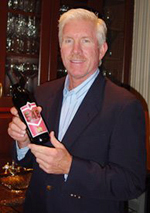 To mark the 22nd anniversary of his 500th home run (April 18, 1987), Philadelphia legend Mike Schmidt announced in April that he is launching his own wine label with other members of the 500 Home Run Club, including Ernie Banks and Eddie Murray. Schmidt, who hit a total of 548 (all with The Phillies), said 100% of player proceeds from sales of his "Mike Schmidt 548 Zinfandel" will help the Cystic Fibrosis Foundation. Player proceeds from the sale of “Ernie Banks 512 Chardonnay,” which launched in Chicago last year, goes to Mr. Banks’ Live Above & Beyond Foundation, which helps inner city children achieve their dreams. And Eddie Murray agreed to launch his own “504 Cabernet” after learning that 100% of player proceeds would support the Baltimore Community Foundation. “I am hoping we can get into the six-figure range at the end of the year,” said Schmidt who has been an active supporter of the Cystic Fibrosis Foundation since 1999, when Brett Weinstein, the son of a close friend, passed away after a courageous 20-year battle with CF. Schmidt, then-retired and living in South Florida, established a fishing tournament through the Cystic Fibrosis Foundation’s Palm Beach Chapter that celebrated its ninth year in May and has raised more than $2 million in memory of Weinstein and in support of the search for a cure. The wine is selling for $18.99. The tasting notes on the 2006 Paso Robles (Calif.) Zin include the following: "Aromas of earth, cedar and black cherries backed up by soft, smoky notes of leather lead to rich smoke on the palate with bright fruit flavors of black cherries and plums, and hints of raspberries. The wine finishes with lingering earthiness and spice. Produced by Eos Estate Winery of Paso Robles, California, and sold via www.CharityHop.com, these 500 Home Run Club wines are available at retailers in each city, as well as in restaurants near the ballparks for a very fan-friendly $18.99. For details, or to order any of the 500 Home Run Club wines, visit http://www.charitywines.com.